It’s good news to know that your kid (or grandkid) loves skateboarding rather than being a couch potato. And now, all they want for their birthday is no more than a new skateboard for tricks. But… it’s kind of arduous in the meantime if you are a person who has never skateboarded or it’s been a while since the last you did. To illustrate those points, I’m going to give you some typical options. Take a look! If your kid (grandkid) is practicing to upgrade from the rookie models, this is the best bet for him. Skateboards for those who are learning to do tricks should be robust and durable to bear harsh collisions in the process of practicing. With the KPC Pro Skateboard Complete, either he is a natural-born-athlete kid aged 8 and up or a beginner adult, it still plays the best job. Aluminum trucks, Canadian maple deck (this type of material is peaks in popularity for its durability) and high-rebound urethane wheels help the board itself enable to bear a heavy body weight up to 210 pounds without a burden. But that is a two-edged sword! Those durable yet heavy materials of KPC Pro Skateboard Complete leads to the lack of speed. In other words, it’s kind of difficult to travel long distances like on a college campus or in the street. However, it strikes back with great stability. This is also another feature that novice riders during their practicing tricks should keep in mind. 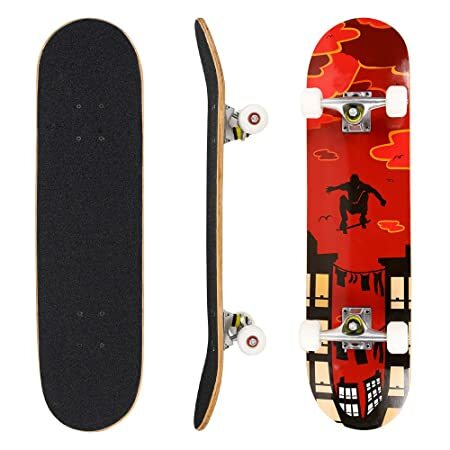 Stability level of this board is shown clearly through two things: smoothly-spun wheels and modern concave that are the keys for riders to learn many certain tricks more easily and quickly, such as shove-its, ollies, 360 flips, and kickflips. Note: Maybe in your very first time skating this board, you will feel it’s a little bit stiff, to overcome it, just loosen the wheels before getting started so that they can roll more easily. In the short story, KPC Pro Skateboard Complete is a great buy for the best partner for any novice riders who are in their trick practicing process. While the KPC Pro Skateboard Complete is just able to perform on skateparks, this Minority’s is way more versatile because it has passed the maneuverability test on ramps, streets, and pools. 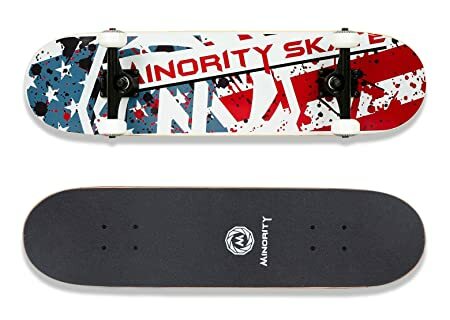 So, if you are looking for a board that can help you practice tricks at anywhere (as long as it’s smooth surface), this low-budget option is a good choice. Like other beginner boards, its wheels are quite thick to save skaters from falling off. You will be amazed by its stability. No snapping in half when putting your body weight on it, neither feeling loose when the wheels are rolling, if not saying that riders can lean forward and backward to keep the best turning with a good grip. Besides, the Minority Maple Skateboard appears to be solid quality with no sign of cheap feeling at all. Featured a 7-ply hard-rock maple deck and 5-Inch aluminum trucks, can’t ask more for a robust and well-made board at such affordable price. In terms of outer performance, though Minority’s skateboards seem to be a bit heavy logo, their graphics are super cool and various in style, from trendy to vintage to surely be a perfect gift. High quality, sturdy construction, competitive price, great stability – sound too good to be true, right? Not quite! As people said “Nothing is perfect”, the KPC Pro Skateboard Complete still has some drawbacks itself. The most typical example is this skateboard gets scuffed up badly on its edges that you might need some grip tape soon if tend to ride it often. But in my opinion, such minor inconvenience can’t hold a candle to this puppy. Still worth a try! Last but not least, it’s the Ancheer Pro Skateboard Complete. The highlight is its wheels which I consider to be the smoothest-spun amongst three options. Thus, if you are looking for a board to handle certain complicated and technical tricks, even some stunts, it’s the best bet. These wheels are made out of 55mm 85A Soft PU, which is robust and stable enough to keep rolling even if there are some pebbles on the road. At the very first time, the skateboard might be a little bit hard and stiff to turn but this issue is rather easy to overcome. Just get relief with some lubricating oil or make some adjustment to its wheels, I’m sure the board will work perfectly again. Only one thing you should keep in mind is that don’t change the bearings if you don’t need to. Another great bonus is its graphics – very bright, well-made and durable to handle nicely stunts and tricks like lifts and curb jumping. Particularly, for the price, Ancheer Pro Skateboard Complete is really phenomenal. Awesome design, great quality, pretty decent wheels, sturdy deck, and good trucks. A professional skateboard for decent skaters, not something that is like a Walmart. Although purchasing a skateboard for tricks isn’t a difficulty, it is essential for you to know that not all boards bring the equal good performance of tricks. As I told you before, stability is the key to help riders practice tricks more easily. And, it is decided by three major features: trucks, wheels, and bearings. 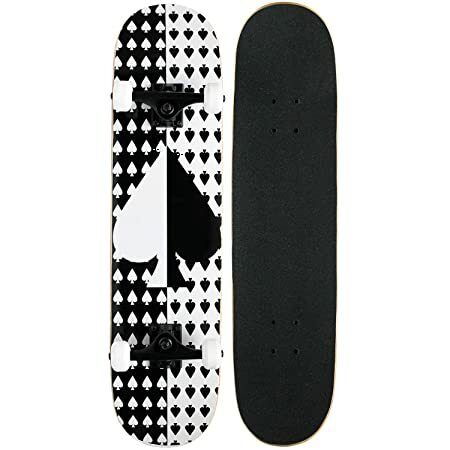 For beginners who don’t get any definition about this term, skateboard trucks are two metal pieces mounted underneath the deck, figuring T-shaped silhouette. They include three main parts: hanger, axle, and kingpin. In brief, the hanger is the metal triangular-shaped part of the skateboard trucks. The axle is where skateboard wheels are attached to. In other words, it’s also the pin running through the trucks. Lastly, the kingpin takes the role of holding these two parts together. It’s usually a huge bolt, fitting inside the skateboard bushings. And why I need to know these kinds of information? – You may ask. In fact, the exact grasp of all skateboard trucks’ parts as well as understand each term’s definition are essential because it helps you identify and measure them more exactly, which is the basis to find out the most stable boards. For example, the truck axle’s width. It should closely match the deck’s width to create the best stability. We’re now looking for skateboards for tricks so, the perfect width for their deck should be from 7.5inch to 8inch. In the meantime, the truck axle should be around 7.75inch. Besides, the truck profile is another consideration. It’s the distance between the hanger and the skateboard deck. For flip tricks, a low truck profile is the best. Aside from choosing the truck profile, you should also consider the wheels as well because these two features have a tight connection to each other. You can’t go for a low truck profile with large wheels and vice versa. High or low trucks will match with the certain type of wheels. For example, for the low truck profile, the wheels’ diameter should be from 50mm to 53mm. (Millimeter is the official measuring unit of skateboard wheels). They are small and slower wheels to deliver the best stability for trick riding. Another feature to keep in mind is wheels’ durometer. It’s a measure of the wheels’ hardness. Remember the softer, the slower, the easier for trick riding. There are basically two scales to measure durometer: The Durometer A Scale and the Durometer B Scale. The A Scale goes from 1-100 to calculate hardness of bearings whilst the B Scale is 20 points lower. For instance, 60b durometer is the same as 80a durometer. The A Scale is used more popularly and the B Scale allows the scale to extend another 20 points for harder wheels. From that point, those using the B Scale are very hard, which is synonymous to their extreme fastness with the least grip. To pick good wheels for tricks, you should go for the soft ones with 78a-87a in durometer. They are great to easily roll over pebbles or cracks for the best stability during trick riding. Last but not least, skateboard bearings! They play a role of mounting the skateboard wheels to the axle. Good news is the bearings come up with just one size. I mean whichever size of the skateboard wheels you choose, they are going to fit pretty well. From that point, you don’t have to bother about sizes when considering the best bearings. Instead, keep in mind the quality. There’s a basic rule of thumb: The more expensive the bearings’ price, the higher the quality. It’s true that excellent performance of bearings can’t come from cheap price. They either tend to break or get deformed utterly under pressure of skating, not saying that they are not sealed at all, which ends up with debris and dirt stuck in your bearings. Sooner, this will slow the board itself down dramatically. You should go for higher-priced ones, they not only arrive in better quality for durability but also deliver greater precession machining to keep precise and fast over time. Plus, the maintenance is proper as well. In terms of bearings’ quality, you should take notice of its measuring unit – ABEC ratings. They consist of grades 1, 3, 5, 7 and 9. Remember the higher it is, the more precise and accurate the skateboard bearings will be. Other than that, ABEC ratings don’t specify any essential factors else like ball precision, material Rockwell hardness, load handling capabilities, the degree of the ball, noise, lubricant, vibration, and raceway polishing. That’s why those bearings classified ABEC 3 can perform greater than the ABEC 7 bearings. Back to the matter of choosing the best bearings for tricks, ABEC-7 and ABEC-9 are fine. Some skateboard bearings might come up with ABEC-11, but they are for pro skating only and plus, very expensive. If you’re just a beginner looking for a board for practicing tricks, those two recommended options above are the best bet. I can conclude that these three are my skateboard of choice for the best performance of tricks and even some “stunts”. I tried to keep a similar price tag to give you the best comparison in quality and other aspects. Their dimensions and weight might be varied a bit, but they are all easy to skate, especially doing tricks (no matter you are a novice rider or a pro). If going for one of these, you won’t regret it, my 8-year skating experience assures you. I got here some beneficial idea that you provided here, thanks a lot fo this crucial idea.